Are “healthy” snacks actually good for you? Vegetable-themed snacks like cauliflower puffs and Peatos aren’t traditional potato chips, but they’re not not chips, either. Recently, I ate some “cauliflower puffs,” which are like Cheetos, only they are not Cheetos, because they are made with cauliflower. Cauliflower is a vegetable. Did you know vegetables are good for you? I’ve heard this. The bag, from a brand called Vegan Rob’s, doesn’t exactly promise that “Probiotic Cauliflower Puffs” are “healthy” — as in, it does not use the word “healthy,” a term that the Food and Drug Administration is redefining at this very moment. But it did say it was “plant based” and “crunchy good!” and also gluten-free, non-GMO, vegan, and “powered by Ganeden BC30 Probiotic,” which, the website for Ganeden BC30 Probiotic tells me, is an “EXTREMELY stable” ingredient added to “many foods” to support gut and immune health. The caulipuffs don’t say they’re “healthy,” but the bag exudes an general aura of health. (We reached out to Vegan Rob’s to discuss, but they haven’t commented as of press time.) The main ingredient isn’t cauliflower — it’s sorghum, no one is pretending otherwise — but still, it seems, at the very least, cauliflower-adjacent. The bag is a vegetal green with a cruciferous print and purple accents. It is granola-chic. If you were in middle school, it is what your weird friend’s cool mom would serve you after school. She would be blonde and elegant but wearing Birkenstocks. “Love yourself, our planet, and all living things,” the cauli bag advises. “Snack as clean & kind as possible.” It says I don’t have to be vegan to enjoy plant-based snacks (true!) and that if I “meditate and focus on the crunch,” I might feel my “stress melt away” as I “reap the benefits of the cruciferous cauliflower.” Vegan Rob is kidding, sort of. Vegan Rob is self-aware. Also, Vegan Rob is very good at making snacks, because cauliflower puffs are delicious. They taste like Cheetos with substance. Is that substance a little bit like sawdust? Maybe. I prefer to think of it as the dust of virtue. It gives them a pleasant sort of heft, like you are eating an actual food product, and not caloric air. At the Kroger I checked, they cost $3.99 for 3.5 ounces, compared to Frito-Lay’s Cheetos Puffs, which cost $1.89 for roughly the same amount. Vegan Rob is not alone. We are living in a golden age of processed vegetable snacks. Once, we were limited to potato chips, corn chips, tortilla chips, and maybe pretzels. Those were the chips. Lay’s. Doritos. Cheetos. Fritos. Tostitos. For the health-conscious, there were Sun Chips — corn chips, but whole grain! — and Terra Chips, which are made from a variety of fried root vegetables and are mostly very pretty. Some are blue, some are red, and others are orange, like impressionism in a bowl. The problem is that chips taste good. People like chips. Chips are designed to be liked. “It’s a classic high-fat, salty food that you just can’t stop eating,” says Traci Mann, a professor of social and health psychology at the University of Minnesota. This has historically been chips’ main selling point. “Betcha can’t eat just one,” challenged Lay’s. “Once you pop, you can’t stop,” taunted Pringles. This product is so good, you will continue to eat it until it becomes a threat to public health. For brands, this presents a market opportunity: chips, but healthy chips, designed to capture consumers who want to “eat better,” whatever that means. Who want to eat vegetables. Who care about health, but also convenience. People who know chips aren’t great, nutritionally speaking, but who want to eat chips. People who don’t eat chips but would if they could feel good about it. People who could feel good about it if only they could be sure that their chip wasn’t the bad kind of chip. Vegetable chip alternatives, by their packaging (earthy and highbrow, which you can tell because the bags are generally matte) and their nutritional brags (more protein! more fiber! ), are positioned as snacks to feel good about, or at least okay about. Chips you could eat while maintaining your identity as someone who mostly doesn’t eat food from vending machines. But are new-wave vegetable chips actually better for you? Is it worth trading your Flamin’ Hot Cheetos for Fiery Hot Peatos? How are we supposed to feel about Brussels sprout puffs, which are exactly like the cauliflower puffs, except slightly greener? Comparing each product ingredient by ingredient — calorie to calorie, protein to protein — you see slight variations. A 1-ounce serving of original Beanitos has 7 grams of fat; an equivalent serving of nacho cheese Doritos has 8 grams. 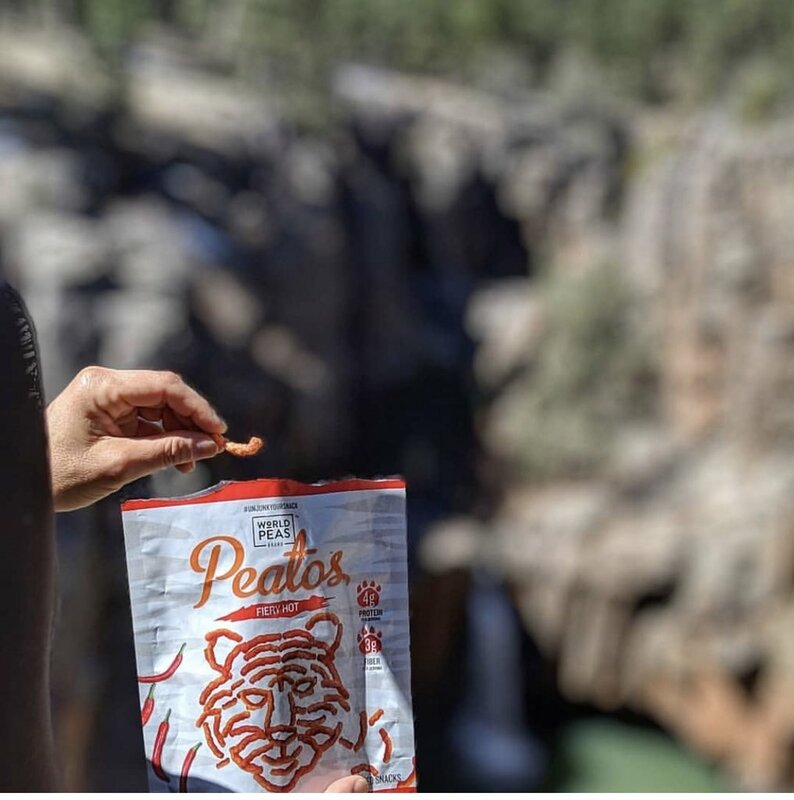 A serving of Peatos has 130 calories, while Cheetos has 160. Calorically, the differences are generally trivial. The new-vegetable chips are mostly lower in fat than their classical counterparts, but not by much: an ounce of Vegan Rob’s Brussels sprout puffs has 8 grams of fat; Lay’s Classic potato chips have 10 grams. Sodium is a wild card: From the Ground Up cauliflower pretzels have 330mg of sodium per serving, for example — less than the classic pretzel equivalent, Rold Gold (450 mg), but nearly double a serving of regular Lay’s (170 mg). Where the alterna-chips come out consistently ahead is on fiber and protein. Splitz, the crown prince of fiber, has 8 grams — about a third of what’s recommended daily for women, in one hip little bag — while potato chips and pretzels have a lone gram. (Most of the vegetable chips hover in the 3-gram range.) The old-school chips have about 2 grams of protein; some of the new health alternatives have double that, or more. While it is definitely true that vegetable chips contain at least some of the vegetable they claim to be chipped from, how much of that vegetable varies wildly from product to product. The first ingredient in Beanitos is indeed black beans; the first ingredient in Splitz is, as promised, yellow pea flour. But Brussels sprout powder — that is, Brussels sprouts that have been dehydrated and ground into a dust — doesn’t appear until midway down the ingredient list for the puffs, meaning they contain more sorghum flour, sunflower or safflower oil, nutritional yeast, and rice bran. “If you like Brussels sprout chips and you can afford 130 or 140 calories’ worth of Brussels sprout chips, great! In terms of health benefits, don’t go for the Brussels sprout chips,” Goldberg tells me. But you knew that already; we all knew that. You’re supposed to eat whole foods, ones that don’t come in packages. You’re supposed to eat fresh fruits and fresh vegetables and not ones that are dehydrated and milled into flours and fried. Maybe they’re a little better than the alternative — a little more fiber, slightly fewer calories — but they’re not a health food, and that’s fine. Not all foods are health foods. What I remember most about SnackWell’s, icon of ’90s ultra-low-fat diet culture, is that they were like regular prepackaged cookies, but a little bit worse. Just a touch less delicious, a pinch less like things that exist naturally on earth. This has always seemed to me to contribute to their glow of health: They’re not as good as regular cookies (to eat), so they must be better than regular cookies (for you). There’s research to back this up. “The finding is that ‘healthy’ and ‘tastes bad’ are highly associated in our mind, so if we hear something is ‘healthy,’ we’re going to think it tastes worse. And if something tastes bad, we’re going to think it’s healthier,” Mann says. This, she points out, presents a kind of challenge for the health-washed junk food industry. “Since they’re clearly being presented as healthy, our response to them should really be, ‘Oh, those are going to taste bad.’” But they sell. They’re everywhere. They’re pretty good. Is it possible this is actually an asset? If no one expects “healthy” chips to be as good as regular chips, they don’t fail if they’re a little weird. As long as they’re still pretty good, isn’t the slight weirdness a sign of their virtue? Is it possible that maybe, by tasting slightly worse — or at least, less familiar — than classic potato chips, neo-veg chips feel healthier? Goldberg buys it. I believe it in my bones, based on the fact that I have yet to leave a bag of new-wave chips unfinished. Maybe the chips will introduce people to new vegetables, make them more adventurous eaters of cauliflower in non-puff contexts. Is that possible, I ask Goldberg? “Do you think so?” she counters. I don’t, although I do like innovation, as a concept. Everyone I spoke with for this story reiterated that if you want to eat a potato chip, you should just eat a potato chip; that if you like cauli puffs, you can have some cauli puffs; that you can be a healthy person who, in moderation, occasionally has some chips made from whatever vegetable you want. Obviously, that is true. “Personally, I love really good potato chips and can’t imagine substituting lentil chips,” Nestle says. But maybe the primary allure of the non-chip chip isn’t exactly that it’s healthy — as Nestle says, people likely know, deep down, it’s not. But it’s just divorced enough from other classic chips — villainous chips, the chips you have been warned about — that regardless of whether it’s actually all that different, nutritionally speaking, it’s different in one important aspect: It doesn’t have the baggage. This is sad, in a way. Wouldn’t it be better if we all had healthy relationships with food, and could eat chips of any kind in moderation, without feeling bad about it, and without convincing ourselves they’re actually salads? Yes. But the fact that we don’t presents food companies with an incredible opportunity: to reconcile the chip as a nutritionally woke snack. “These products are a proliferation of marketing genius,” Goldberg says. There is one other detail, though, one persuasive argument in favor of the new chip revolution, and that is that it tastes pretty good. It’s novel. Have you had a cauli puff? You should, it’s fun. There is so little fun in the world. But weird chips are fun. They aren’t vegetables. They are nutritionally variable, at best. But we can enjoy them for exactly what they are: a marginally better-for-you entry into the canon of festive snacks. Is Healthy Snack Food Actually Healthy—or Just Addictive?